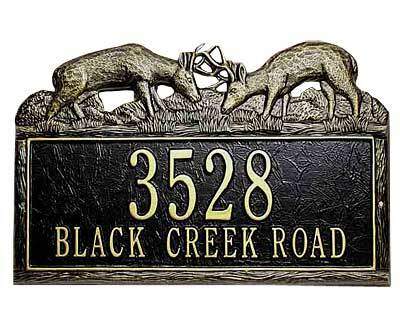 Bring an outdoor feel to your home using the Whitehall Dueling Buck Wall Plaque. This bold sign displays an exciting natural scene for your home. The top of the marker depicts two bucks, with antlers locked in a fighting position. Grass, rock, and mountain shapes in the background create a complete setting. The frame of the unit is also textured to evoke twigs, continuing the theme. The two customizable lines highlight your address or name with ease. The top line holds five 3" characters, while the bottom line accommodates up to seventeen 1.25" characters. Use the two predrilled holes to place this sign against a wall or other flat surface, ensuring visibility. The sign is cast from aluminum, for an all-weather and durable marker. Showcase your love of nature with this Dueling Buck Wall Plaque. Made in the USA. A black plaque with gold characters is pictured to the left using the color code "BG". Simply use the color chart and spaces below to choose your style and enter your personalized lines.